This auto feeder is easy to program and reliable. The drum rotates everytime it should without fail. The one issue I have is that it doesn't dispense small petals very well. On one setting it drops too little and the next setting up it drops way too much. I have to set it to dispense in the middle of the two setting which is not ideal. I'll probably be trying a different auto feeder that can feed the small amount more times a day. I've had this for a year or two and it's as reliable and consistent as $30 will get you. It does get salt particles in the mouth and clogs from time to time, but that's a function of sitting near salt water constantly. Try a piece of tape to hold the mount open at just the right amount and a tooth brush to clean it out. Just want to warn others as I did not fully understand why so many reviews talked about their feeders falling in the tank. Well its because they did not design the clamp so its usuable, unless u have a rimmless tank. They expect you to place it on top of a canopy. The clamp is way to small to fit most aquariums. You need to cut and modify it so it fits over your rim. Its my fault as I should of sent it back, but I didnt want the hassle and be without it. I figured I would get my buddies skill saw to cut it. I was super careful and placed it on top but sure enough it fell in as most will eventually will without mods. Just frustrating because it should come standard to fit most tanks without cutting it! Unless u have a rimless tank or like moding things so they work dont buy it. Lots of others that you dont have to deal with this. Overall it's easy, it's cheap, and it works. I would suggest adding a little weight to the back if your not clamping it down as it gets tippy when it's full... which is why I bought a second one. Works pretty good, but drop it in the tank once, it's a paperweight forevermore. I tried drying it out with rice. Still no good. If I wasn't poor I'd buy the apex one, but this one seems to work when I test it. Having a screen too on a cube has made it challenging or maybe there is a better way to mount it? Either way it feeds the fish, more than I would like to feed them but they get fed! If you have cats, be sure the feeder is well secured! We have a glass-top tank, perfect for placing the feeder on, but didn't think to "bolt it down." Came home and found that our cats had repositioned it [probably attracted to the sound and movement] and there was a nice pile of food collected on the top of the tank. The fish was fine, and at least he [large GF] hadn't been over fed while we were gone. Had one now for over a year, using pellets. Has been great even dropped it in tank and still going after allowing it to dry out a few days. Only complaint of any sort is you have to be very careful with the door, as opening it up a click or 2 larger than planned will allow much more food to escape than planned. Food clumps inside because of moisture if you use it as every day feeder. This stopped working after about 3 months of use. Looked inside with flashlight and battery connection strip is all corroded. No contact. Made a warranty claim but service is a joke. 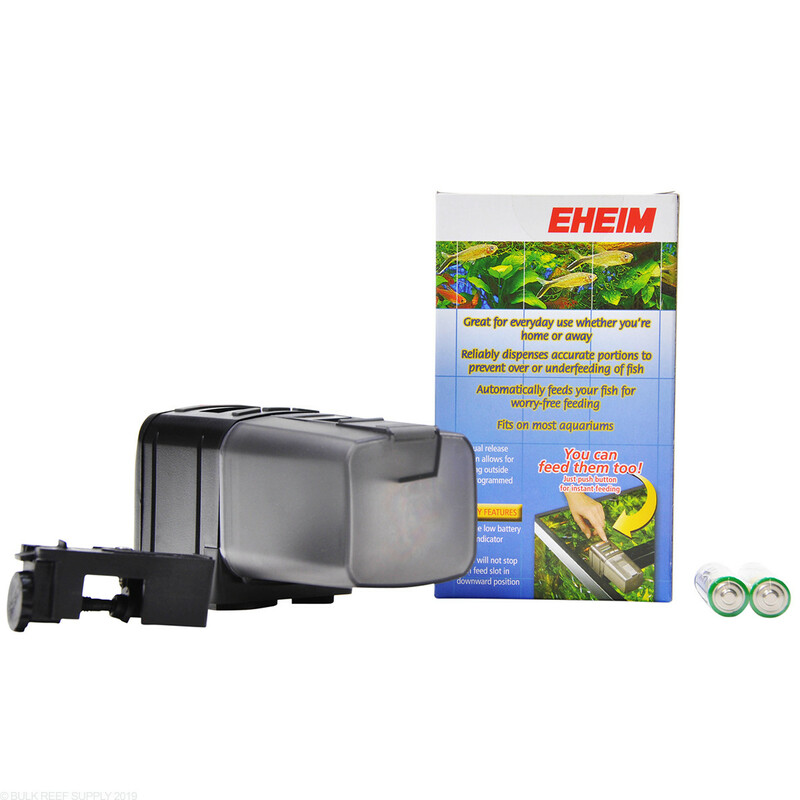 Won't buy any products from Eheim again. I love these! Ordering my third one, but that's only because I have a habit every year or so of doing something that knocks it into the tank. They don't fair well too being submersed. Other than that they're set and forget until you see the food bin is getting low. 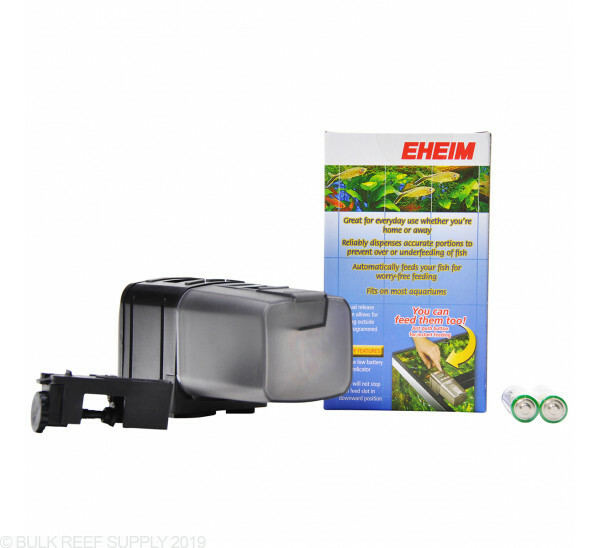 - Does this model works on salt water fish tanks? - Is the system stable on the corner of the fish tank so doesn't fall to the other water? - Does it work with any kind of food? How many days would this feeder last? Say we set it for 2 feedings a day, would it last 7 days? Depends on how much you set it to feed and how often you feed. Easily will last a week for most hobby systems. I understand this has an adjustable door for the amount of food dispensed, but I have a 125 gallon stocked with 4"-6" African Cichlids. Would this be sufficient enough for them? This can work for a variety of pellet food sizes and holds up to a 4 oz container of food. Feel free to let us know if you have any further questions! Setup of the feeder is pretty easy. You'll first want to use the Mode button to get to the feeding you'd like to set ( there are 4 feeding times a day available), and then you can press the Set button to activate and change the time. use the + button to change the time. You can press the Mode button to switch between hours, minutes, and the number of feedings (indicated above the time) per interval. Once you have the time and number of feeding where you want them, press Set again to finalize. You will then press Mode again to toggle to the next feeding interval and follow the same process for each. I am going to be gone for 12 days. 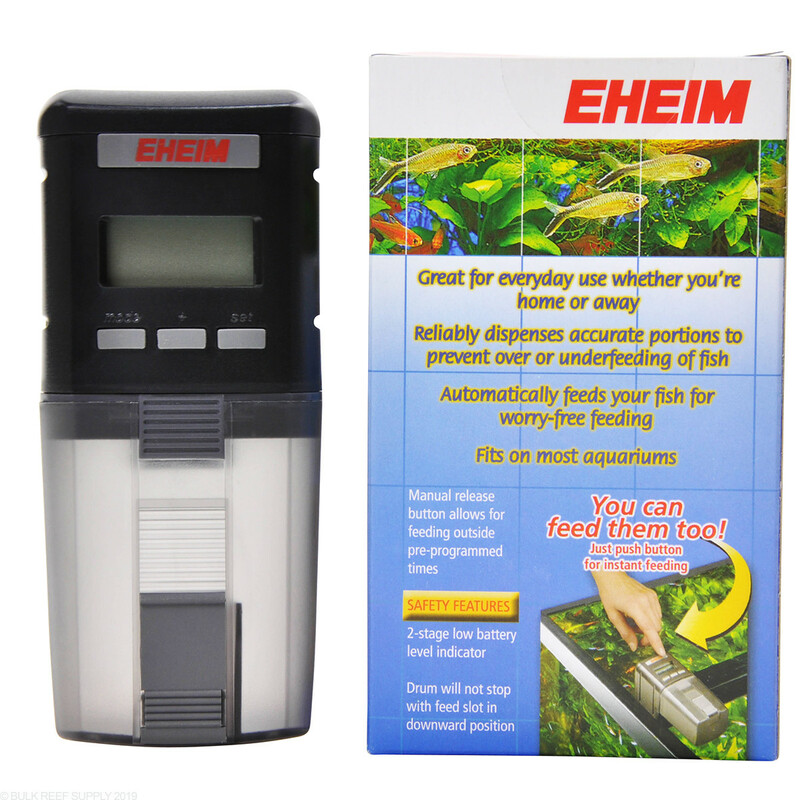 Will this system be sufficient to feed my fish twice a day for 12 day? I have a 20 gal tank. 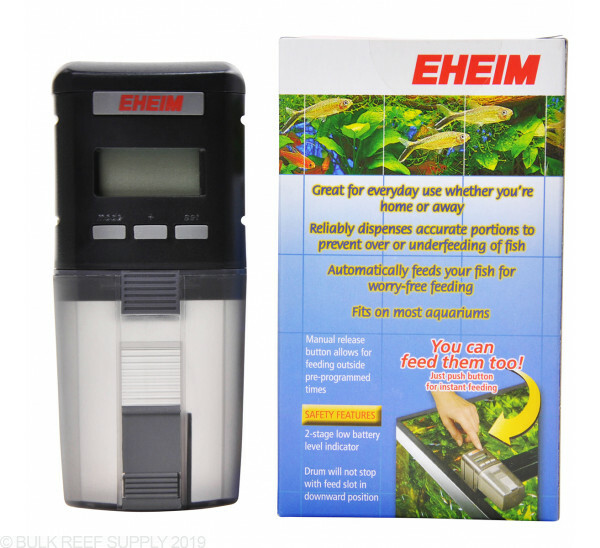 The Eheim Everyday Feeder should likely take care of your 20g tank for that time frame, depending on a few variables: The amount of fish and how much you feed them. It has a 100mL capacity and depending on the type of food and the setting you have it on that will dictate how long it will feed for. We have had very good luck with the Neptune Crossover Diet with automatic feeders.